After canning 26 quarts of grape juice and 5 jars of jam last week, we took a few days off (during which I made lacto-fermented pickle spears and peppers) before hitting up the grapevine again for the last of the summer’s harvest. This time around we decided to process most of the grapes for juice using a traditional drip method, in order to can it as grape jelly and syrup. My amazing grandmother, who is in the hospital today recovering from an unanticipated heart procedure, used to make grape jelly this way for her ten children without help—I honestly don’t know where she found the energy, because this project ended up taking all three of us and used pretty much every bowl, bucket, and pot in the house! We couldn’t find any jelly bags at the several stores we checked out this week, so we ended up rigging our own—I think what we ended up with is worlds better than the commercial options anyway, at least on a small scale! This is the base of a stand that my dad made years ago for our double-yellow headed Amazon parrot, Pogo; we don’t have Pogo anymore, sadly, but this little rig turned out to be ideal for straining grape juice. 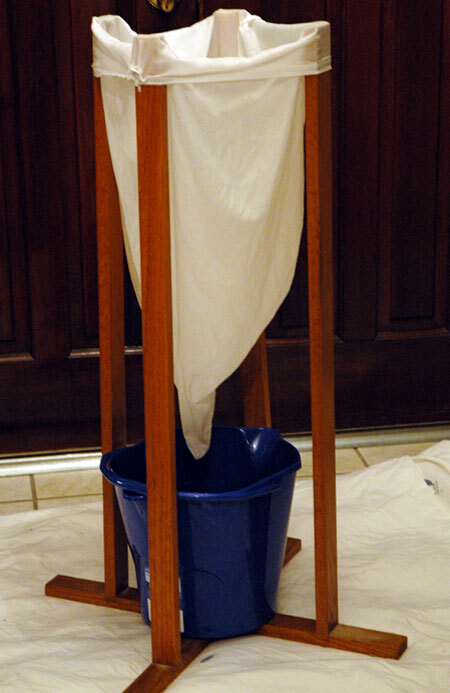 With a bucket in the bottom and an old pillowcase wet down and folded over the legs, all we had to do was smash up some grapes and dump them in. Here I am ladling grape mash into the pillowcase. We filled up our biggest pot with grapes, squashed them with a potato masher and brought them up to a simmer on the stove for 10 minutes to help release their juices. 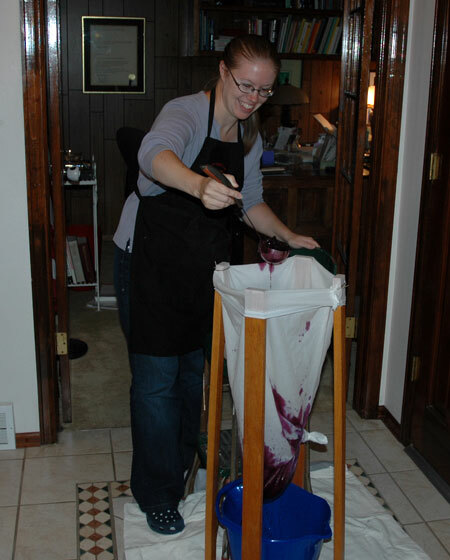 We were a little nervous about just dumping that big pot of steaming, staining grapes all at once into an untested contraption, but it held up perfectly. You can see in the photo above that I tied a knot in one of the pillowcase corners to make the bag more like a funnel. 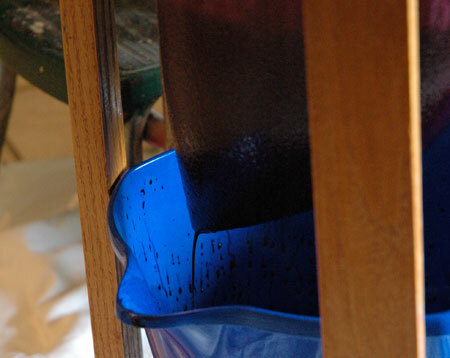 That turned out to be a good idea too, because the juice all wanted to drain out in a stream through the lowest corner. We let the grapes drain overnight, and in the morning there was about half a bucketful of gorgeous clear grape juice waiting for us. Over the course of the day, I loaded up the bag with more potfuls of grapes, and again in the evening before bed; our makeshift juicing rig was in constant use for almost 48 hours straight. 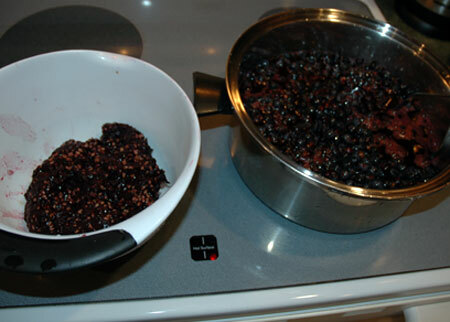 Here you see a potful of mashed grapes simmering on the stove, almost ready to ladle into the pillowcase. Beside it in the bowl is the spent mash from an equivalent amount of grapes after draining overnight. 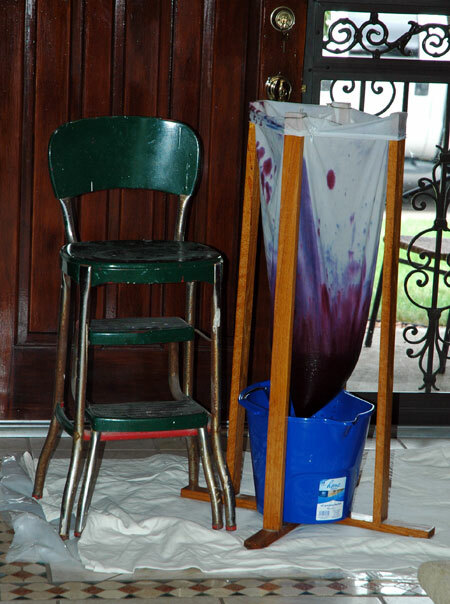 I took the time to squeeze the pillowcase before dumping out each batch of grapes, to wring out as much juice as possible; although purists would call this move a no-no since it produces cloudy juice, I hate to be wasteful, and decided to use the pressed juice to make grape syrup. (This extra step was reminiscent of nothing so much as milking a giant beet, or possibly a vampire cow.) Even the grape mash, called pomace, doesn’t get wasted—it is an incredibly rich addition to the compost pile (and if I had an oil extractor, I would probably be trying to make grapeseed oil right now too, lol!). 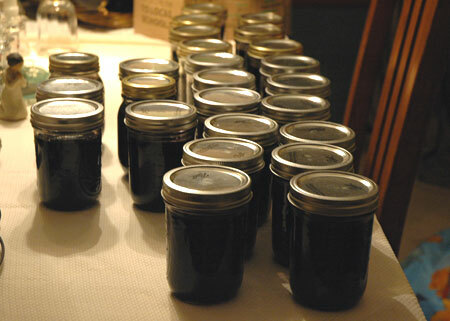 We ended up with approximately 34 cups—over two gallons!—of incredibly flavorful grape juice, and spent the better part of the next day making and canning grape jelly. I didn’t get fancy here: all we needed was organic sugar, a little pectin, and all that gorgeous purple juice. 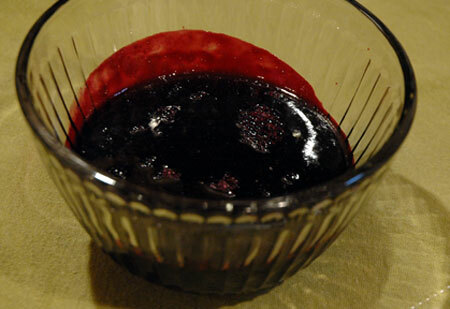 This photo shows the jelly leftover from one batch, jiggling like a bowlful of… well, you get the idea! I worked out some proportions that gave us just the right soft-set, sweet-tart jelly, and we pumped out batch after batch, ending up with 25 pint jars for our efforts. Something tells me we are going to have to share the wealth here a little bit! And we still had enough grapes leftover for two grape pies, plus an indeterminate amount of canned grape pie filling, and of course the syrup that I haven’t quite gotten to yet. Praise God for such a bountiful harvest! Grapes are so good for us, and Nolan is already a fan of this jelly. 🙂 Thank goodness we are almost done for the year, though, because my legs are exhausted, my hands are all dried out and will probably be purple for weeks, and the stove may never be quite the same. I won’t go into the details of canning here—sterilizing jars and lids, keeping everything hot, etc.—since your local state university extension office is an excellent source of this kind of information. Also, I highly recommend not letting the jam boil over and create a huge blot of burnt sugar where your stove’s burner used to be. Mix all ingredients together in a big pot and bring to a boil, shooting for 8° F over boiling point (which decreases by about 2° F for every 1000 feet above sea level). Freeze a spoon or plate to test the gel point when the temperature is getting close, then ladle into 6-7 sterilized pint jars and process for 5 minutes (adding 1 minute for every 1000 feet of altitude; we processed for 10 minutes total).